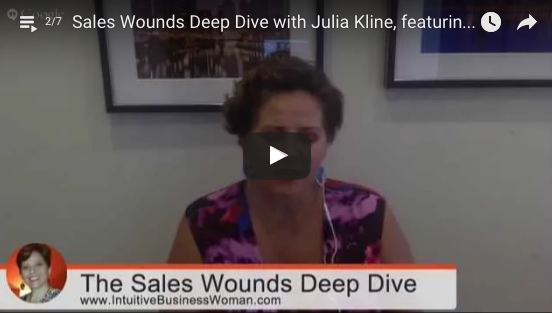 A regular feature over on my YouTube channel is the Sales Wounds Deep Dive. In case you haven’t made it over there yet, I thought I’d make this post to let you know what I’m doing over there. Sales Wounds are the limiting beliefs that people hold about money, success and salesmanship, that keep them from being better at sales. But as you’ll see in these Deep Dives, Sales Wounds don’t just affect a person’s business, or their ability to make sales. Sales Wounds reach deep into the corners of people’s hearts and psyches, affecting every aspect of how they live their lives. Evie is a coach, and in the past, the part of the sales conversation that has always tripped her up is when it’s time to say, “I understand your problems, now here’s how I can help you with that,” and lay out her offer. We identified that Evie’s main blockage was that she wasn’t allowing herself to fully step into her role as Expert. In other words, she was taking what the customer said at face value and letting it go at that. Instead, I showed Evie how to say, “I actually have a slightly different perspective on what’s got you stuck – would you mind if I share?” And then walk the customer through a new way of viewing his or her problem – one that would naturally lead to hiring Evie to help them solve it. This opened the floodgates of possibility and permission for Evie, and by the end of the Deep Dive, she was feeling fully congruent and aligned with the whole sales process. Click here to read more about all 6 of the Primary Sales Wounds.